So how does Zubuchon compare to the traditional Cebuano lechon flavor? Like the traditional Cebu lechon, Zubuchon's version is also generally salty (You can really taste the rock salt or sea salt). The difference is that Zubuchon uses a lot of peppercorns to flavor the meat. While these unground peppercorns gives Zubuchon's meat its distinct flavor, I find them too much of a nuisance when eating as it's all over the meat and I bit on some of them. 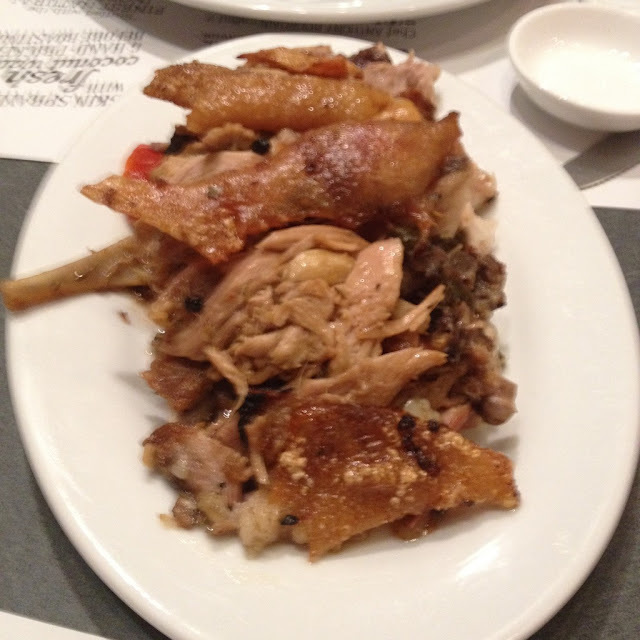 I also noticed that the skin color of Zubuchon is paler in color compared to that of the traditional Cebu lechon. According to the literature on the Zubuchon website, this is because they wipe the skin with olive oil and spray it with fresh coconut water before cooking. In cooking traditional Cebu lechon, the meat is wiped with soy sauce and sugar water primarily. Zubuchon also pricks the skin of their lechon on purpose. 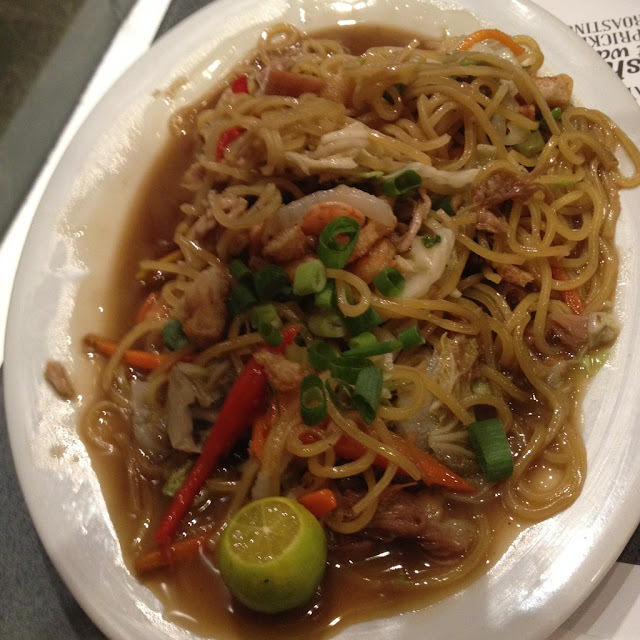 We also ordered the Zubuchon Pancit which was their take on the pancit canton. The noodle dish contained lechon bits, shrimps, carrots, onions, and bell pepper. I found the dish too salty and too fatty because of the lechon bits in it. Zubuchon's name was derived from "Zubu", the name of Cebu in old maps, and lechon, Cebu's famous roasted whole pig. The man behind Zubuchon is Joel Binamira of MarketManila fame. Zubuchon started in 2009, a year after famed chef and TV personality Anthony Bourdain proclaimed that the lechon Joel cooked was "the best pig ever". You will see this quote prominently displayed in Zubuchon's stores. Zubuchon actually stirred some online controversy when a news article claimed it is Cebu's favorite lechon. Do you think there is truth to their claim? Share your thoughts in the comments section below. Zubuchon, serving pinoys favorite delicacy. For me, it's lechon at its best!